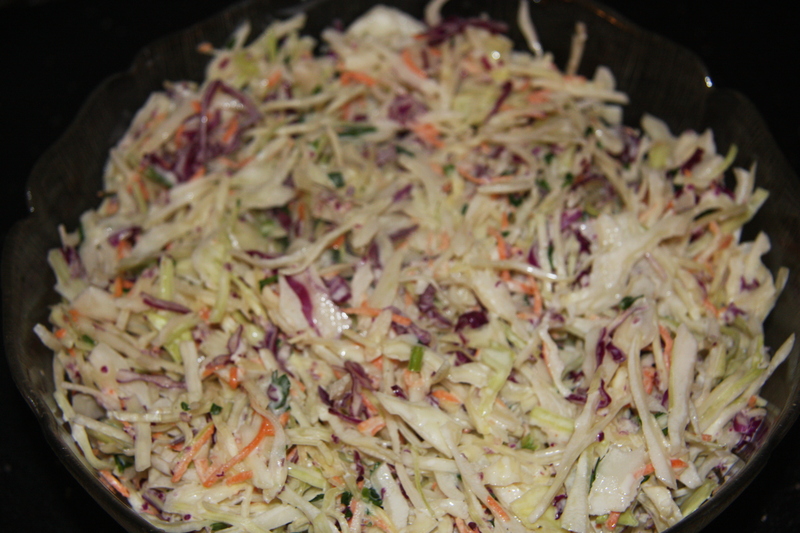 If you like coleslaw salad you should like this. 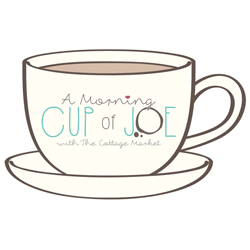 It is a nice change from the regular one with oil and vinegar. Simple and quick to make with a food processor and is so yummy with or on meals.Great on burgers, tacos, cutlets on a bun, or with steak, chicken, and absolutely wonderful with fish. It will stay for a long time refrigerated and will also feed a large crowd for such a reasonable cost. People will try it and much to their surprise will like it. Have it for lunch, supper or a snack. I love putting in a sandwich with some cold cuts, or with leftover breaded fish or chicken. Wrapped in a tortilla with shrimp and even a little hot sauce gives it a wonderful crunch to a quick and easy meal. 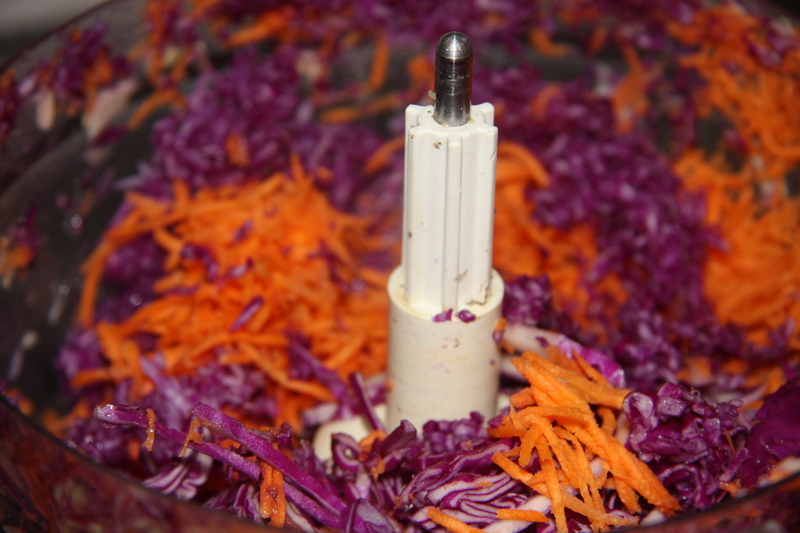 Into a food processor add about 1/2 green cabbage and about 1/4-1/2 red cabbage. So easy and fast to do it this way. 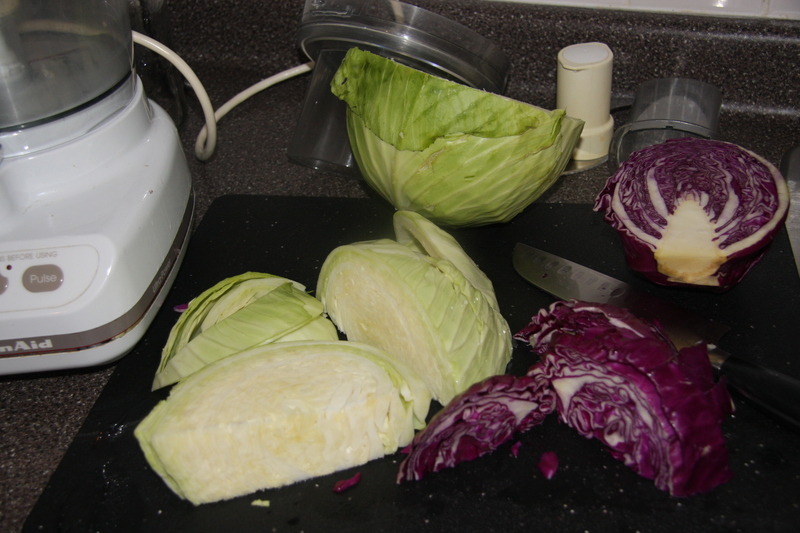 Not to mention that your sliced cabbage is uniform in size. 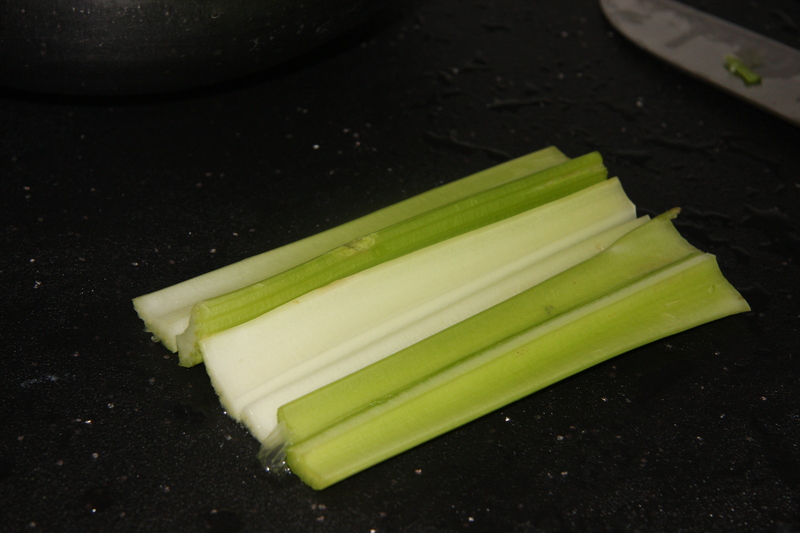 3 ribs of celery halved and sliced. 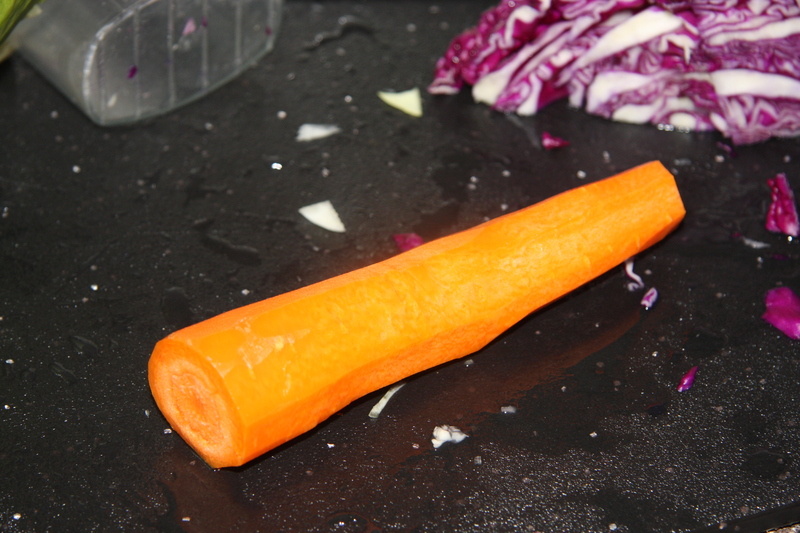 Also peel and shred 1 carrot. Place all the veggies into a large bowl. Doesn’t it look great? It’s not even finished. 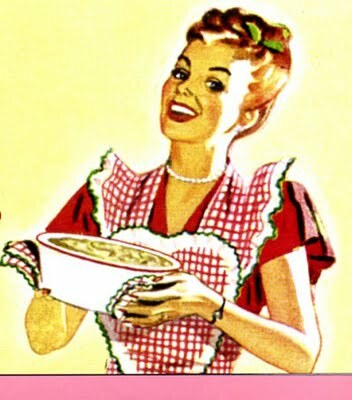 Now just add oh about 1-1/2 cups of MAYONNAISE, not miracle whip and 1/2-1 cup of milk into a jar, along with 2 tablespoons of sugar, salt and pepper to taste and about 4 teaspoons of vinegar. The dressing should not be too runny but not to thick either. Hey but if you like it that way, go for it. Give it a real good shake and pour it over the cabbage. 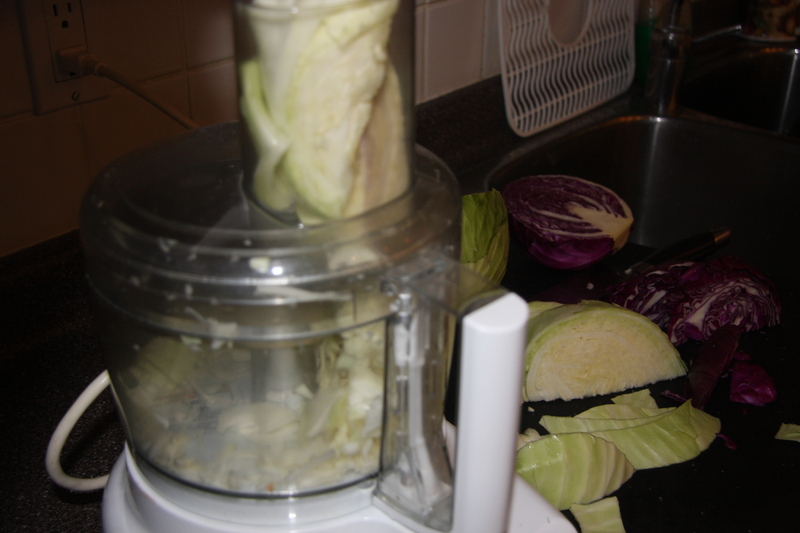 Mix the cabbage in the dressing to coat and refrigerate for at least a couple of hours. 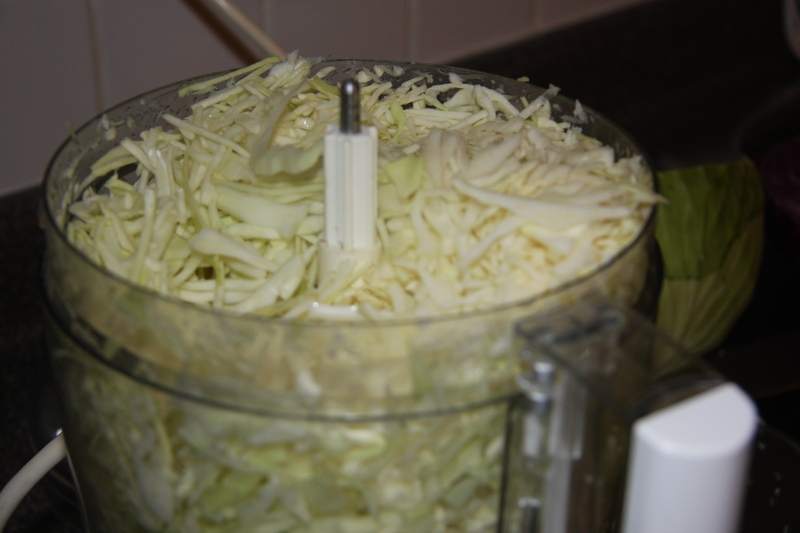 Into a food processor add your cabbage followed by your celery, and carrots. When the veggies are sliced place into a large bowl. Into a jar add your mayo, sugar, vinegar and milk . Give it a real good shake and pour it over the veggies in the bowl. Mix well and then add salt and pepper to taste. This recipe can easily be adjusted by adding more or less of what you like. 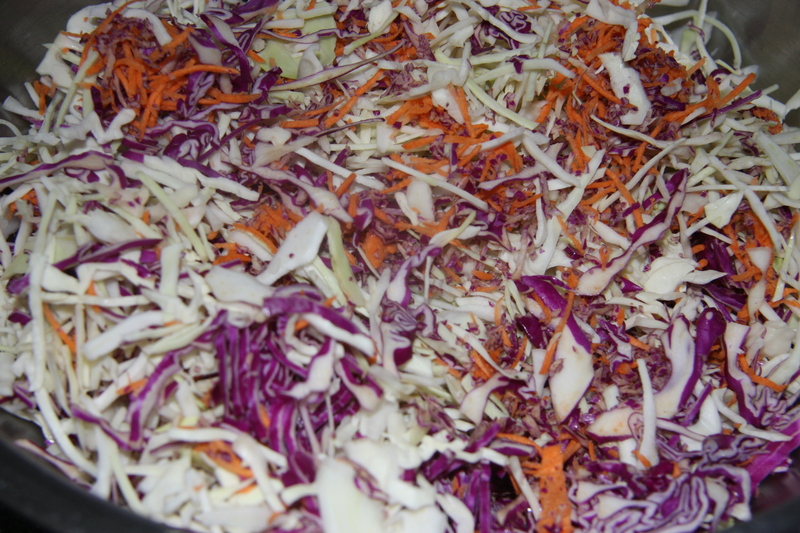 But I have found this is usually the standard for a coleslaw salad. Refrigerates really well. Just remember to make it according to your taste. Every cook should try it.